Thus an endlessly entertaining word game was born: inventing new collective nouns. 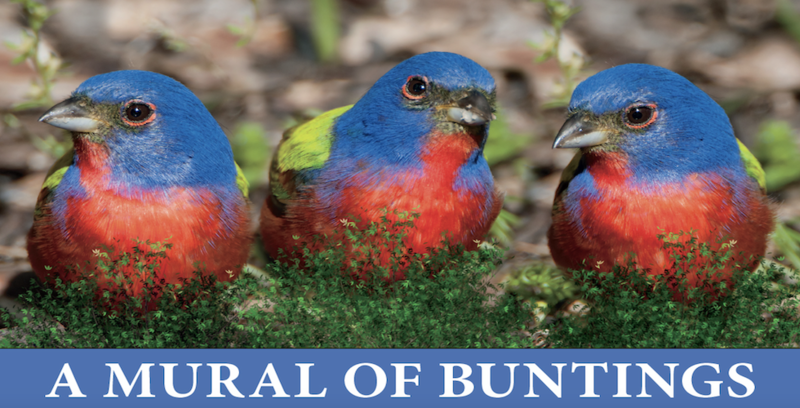 Once you start trying to find the cleverest and most apt word for each bird group, it’s hard to stop. 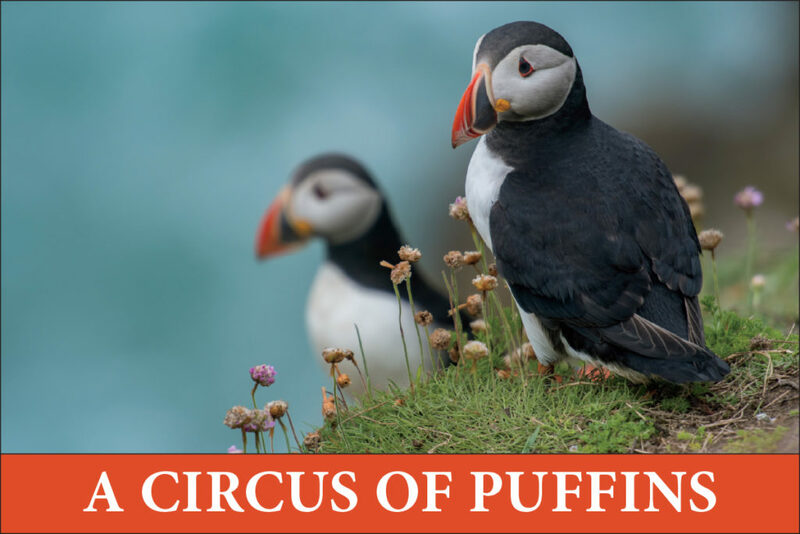 PUFFINS, an improbability or circus of . . . The tuxedo-colored coats, strangely shaped red beaks, and combined awkwardness and beauty of puffins make them seem unlikely creatures to many observers, hence “improbability.” It’s the same bright colors and clumsiness that caused them to be dubbed “clowns of the sea” and resulted in “circus.” See also Auks. 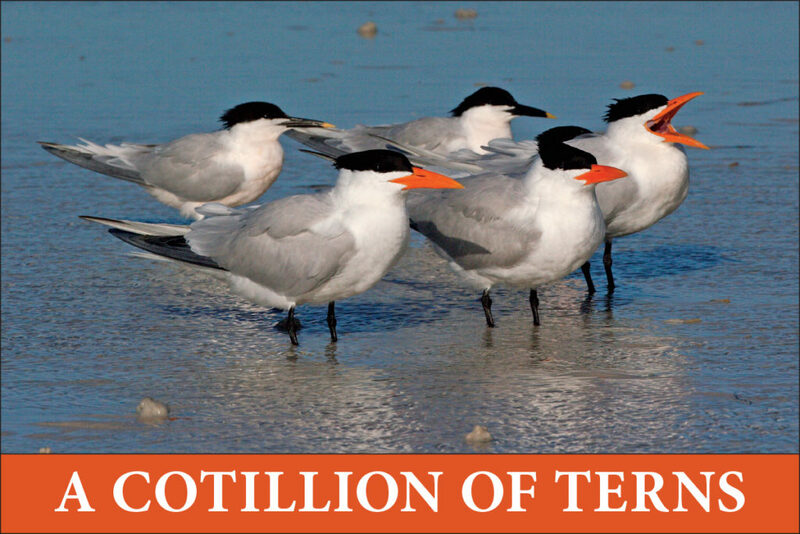 TERNS, a cotillion of . . . Male terns court their partners through displays and ritualized fighting, calling to mind the rituals and showing-off of a cotillion ball and the dances done there. 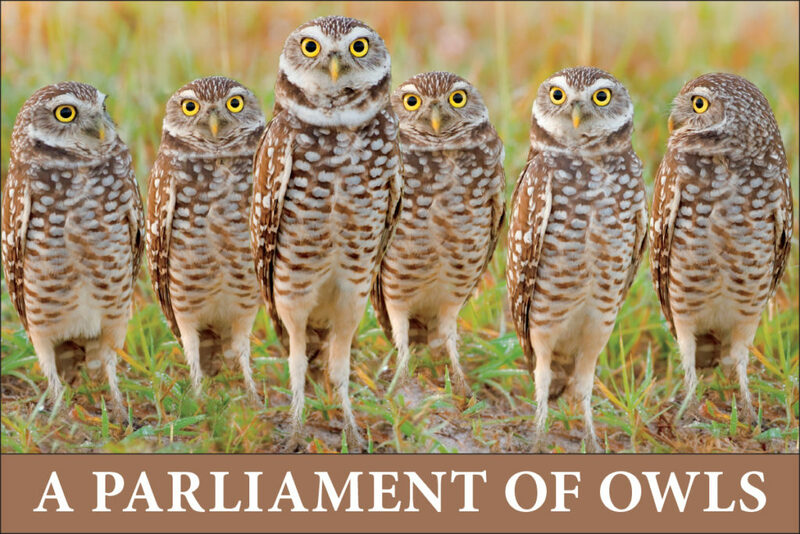 OWLS, a parliament, wisdom, or sagaciousness of . . . Chaucer was probably the first to use “parliament” as a collective noun for a group of noisy birds in general. In early uses, it was more often used for a group of rooks (see Rooks). But its use for a group of owls picked up steam as a rhyming play on the title of Chaucer’s poem Parlement of Foules, and also because it captures something about the way we see owls in popular culture: wise, perhaps pompous, and absolutely capable of meeting in a conference to noisily discuss and argue over plans. The widespread knowledge of this collective noun can also be credited to a development in the 1950s: in The Chronicles of Narnia, C.S. Lewis creates a council of owls who meet at night to discuss the affairs of Narnia, which is literally called “The Parliament of Owls.” Since the huge international success of the Narnia books, this term has become one of the most popular and most used collective nouns. 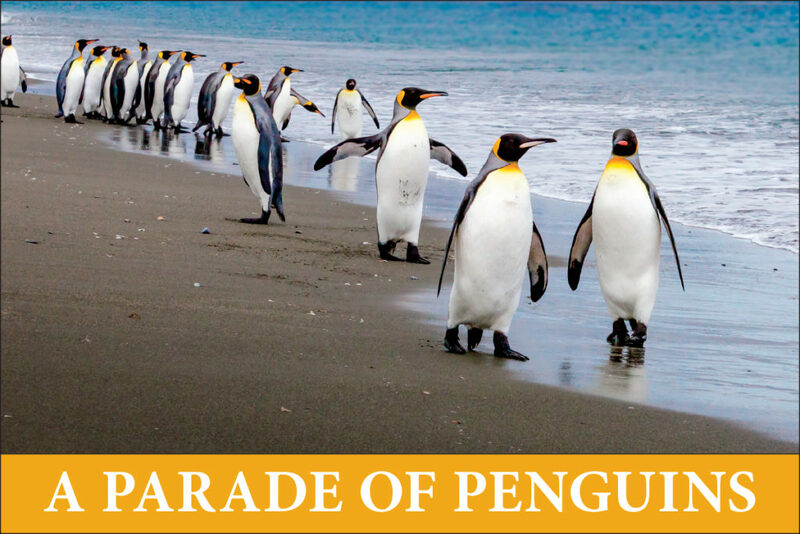 PENGUINS, a waddle, huddle, or parade of . . . As portrayed to great comic effect in a number of animated movies, penguins walk with a distinct “waddle,” using their tails and wings to keep their balance in their upright stance. “Parade” is also likely a (delightfully alliterative) reference to how that waddle looks when a big group all walks across land together. Emperor penguins are also famous for “huddling” together to conserve heat in the frigid Antarctic. They are so efficient at this that they have to switch positions; the birds on the outside get too cold, but the birds on the inside actually get too hot!